Ten FAVORITE quilt patterns all made with one easy interfacing shape! ALL these GREAT CURVES with NO CURVED PIECING - EASY Method! RUNNERS through KING size for each pattern! Wow, that was a LOT of math! Three interfacing panels included to complete 1 table runner project (1 panel each of: Rob Pete, Circles, Tulips & Toes). Poke on Pink (click on book to cycle through photos) - LONDON BRIDGE pattern is a great STASH BUSTER! Quick and fun to make! Poke shows off our pink London Bridge Quilt by Yvonne Geske. Simply adorable! Instructions start on page 24 of the book. Number of "Rob Pete" Panels Required: Runner (1, included in book), Small - shown with Poke (2), Lap (4), Twin (5), Queen (8), King (10). Scroll down to the bottom of this webpage to find a link for the additional panels. You will get 1 panel with the book. Take a sewing vacation at home and use your stash to make the adorable "Aloha Island" quilt (click on book to cycle through photos). This quilt is pictured on page 47 of the book. 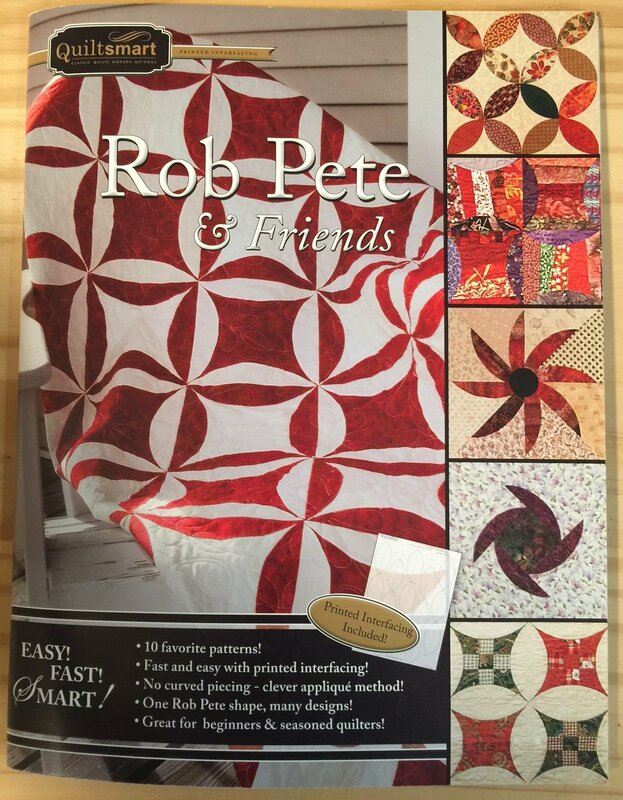 There is one panel of Rob Pete interfacing that comes with the book. That is enough to make about 3 of these quilts depending on how you might vary the number of palms. The trees are made from the "Black-Eyed Susan" blocks featured in the book, and 1 "Whole Shape" (surfboard), and 1 "Half Shape" (hammock). We used Circles for the base of the trees (1 panel included in the book). Additional materials required: Tree Trunks: 1 panel Double Wedding Ring Printed Interfacing (technique is similar to Rob Pete / instructions suggested if you don't have them / videos are also available on our site). Waves: 1 panel smart-ease Broadway Border (the pack - 2 panels - is recommended for first time users as the instructions are included). 48 pages.